If someone were to ask me to come up with a nickname for the current console generation aside from “Gen 8”, I’d probably have to go with “The Second Chance Generation”, largely due to the steady streams of HD Remasters, up-rezzed Definitive Editions and Collections that have been making their way unabated to the Xbox One and PS4 as of late. While more than a few recent remasters (that shall remain unnamed) have clearly been cash grabs aimed at capitalizing on Gen 8’s noticeable lack of new, original IP, quality current-gen re-releases such as 2014’s Tomb Raider: Definitive Edition have shown that games that were sorely overlooked during last generation due to multiple factors can still bounce back and become a commercial and critical success if customers are given enough new incentives to check them out. 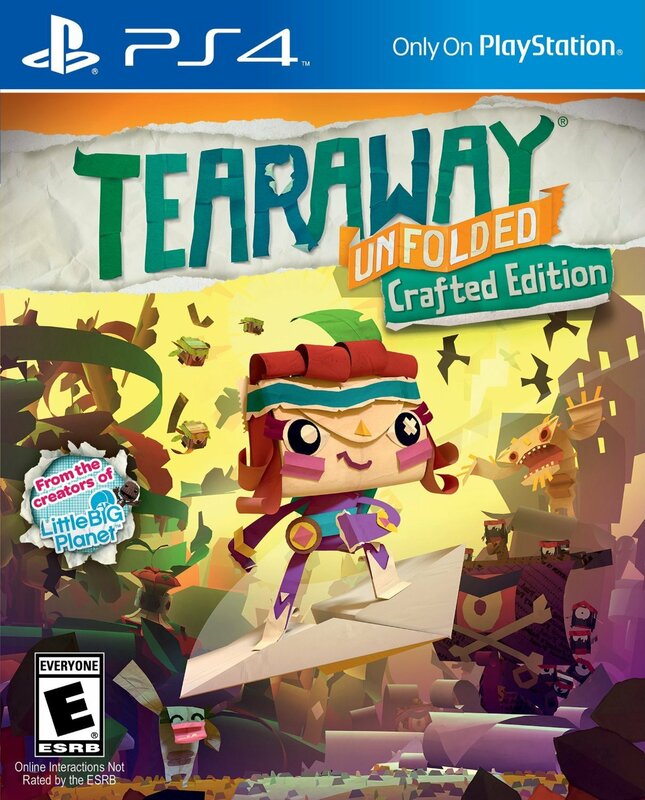 Clearly, this thinking was one of the influences behind developer Media Molecule (Mm)’s bold decision to bring its beloved PS Vita platformer Tearaway to PlayStation 4; a game that was universally praised for its originality and inventiveness but until now has been limited to the doomed handheld’s dwindling install base. Tearaway: Unfolded is no mere remaster or port, however. 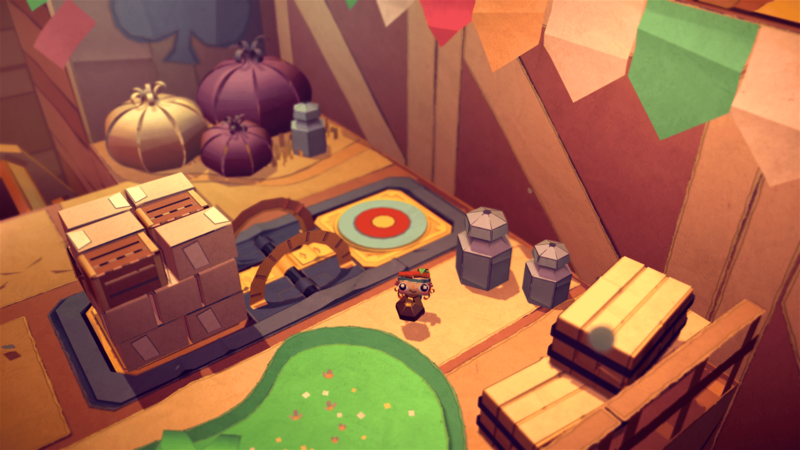 Half of the original Tearaway’s charm was its meaningful implementation of every key PS Vita hardware feature (such as the handheld’s touch surfaces, built-in cameras and gyro-sensors), so Mm has wisely re-imagined the game for PS4, adapting its fundamental gameplay hooks to the tools readily available—namely the versatile DualShock 4 controller. But before we dive into how well Mm has achieved this however, let’s cover the similarities. The components that make up the other half of Tearaway’s charm, those being the whimsical journey that messenger Iota/Atoi takes in order to deliver an important, top-secret message to “You” (a.k.a. the Player), the fourth-wall-breaking gameplay mechanics that create the bond between the player and the messenger, and the original game’s well-balanced blend of platforming, puzzle-solving and (at times) challenging combat with the game’s mischievous “scrap” creatures have all made it over intact. The early part of the game feels like a slower burn as a lean-back, couch experience as opposed to the handheld version, and I embarrassingly found myself losing Iota’s stamp (i.e. dying) repeatedly as the game’s mesmerizing soundtrack and beckoning environments often lulled me into sleepwalking off a cliff, but I ultimately chalked this issue up to Unfolded’s “bedtime story” nature rather than a fault with the game’s pacing. That said, the excitement picks up considerably once Iota gains more abilities and combat becomes more frequent. The PS4’s beefier hardware has also allowed Mm to retain the playful, papercraft look and spirit of the original game but offer much more of it at a smoother 60 frames-per-second, creating a more vibrant and tactile-looking world to get lost in and interact with. This of course brings us back to how Mm has almost flawlessly redesigned Tearaway for use with the DualShock 4. Cleverly taking notes from the PS4’s pack-in launch game The Playroom, Mm has taken practically every gimmick in the DS4’s arsenal and has applied each one to serve fun yet fully-realized emergent gameplay (much like the original Tearaway fulfilled the gameplay promises long made by the PS Vita launch title Little Deviants). For example, the DS4’s Sixaxis motion controls and lightbar together serve as the You’s “Guiding Light”, allowing the player to shine light into the darker areas of the game world to reveal secrets and affect changes in the environment by nourishing the local flora with its warmth (e.g. shine light on a sprout and it instantly grows into an adult tree, its branches forming a bridge between two ledges for Iota to cross). While the lightbar itself does not actually communicate with the console or PS4 camera (if connected), its symbolically familiar, transparent outline represented on the screen when the Guiding Light power is in use informs the player of the controller/light’s position, knowledge of which is essential for other key game mechanics. For instance, the Guiding Light can be used to hypnotize, distract, and even corral evil scraps away from Iota (and towards pitfalls), and when creating paper works for use in the game, it is used for selecting colour palettes, picking up and moving created shapes and in concert with other buttons is used to rotate, resize, and alter the appearance of those shapes. Surprisingly, the real workhorse is the DS4 touch pad, which sees far more use in Unfolded than it ever has in any other game. Several key “You” powers are bound to the touchpad, such as the power to create gusts of wind by swiping on the pad in a desired direction (essential for creating temporary bridges, moving large obstacles, and granting Iota the power of flight in certain situations), or the ability to activate large drums in the environment by tapping or holding and releasing the touchpad, enabling Iota to bounce to otherwise inaccessible areas, solve environmental puzzles and dispatch specific types of enemies. Finally, all three aforementioned features of the controller come together in the “Throw Forth” ability, where the player can have Iota toss him or her an object via the screen, agitate it by shaking the controller and then launch it back at a target using both the Sixaxis+lightbar to aim and the touchpad to fire the missile via a gust of wind. This indispensable power serves multiple purposes throughout the game. 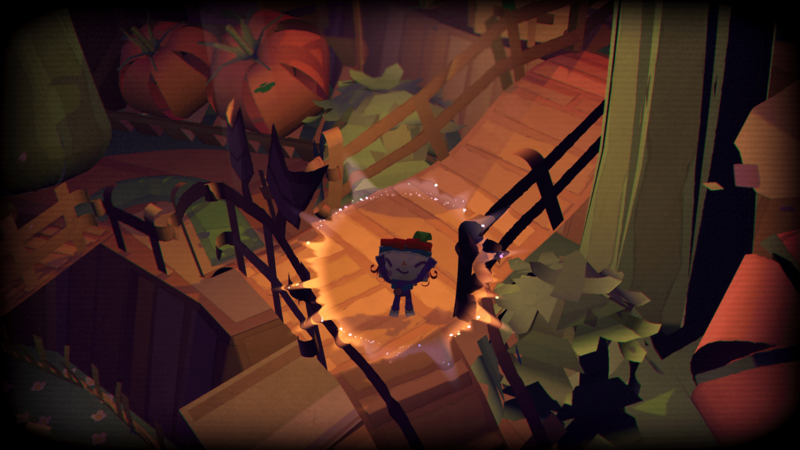 To get the most out of the Unfolded experience however, players will want to have the optional PS4 camera connected while playing, as it best replicates the original Tearaway experience where players themselves can visually participate in the game as a character, lend their voice to optional interactive scenes and take photos of real-world objects, patterns, and even themselves for use in the game world. One of the most common complaints about the original Tearaway was its short length, but I myself did not find this to be an issue with Unfolded, as the interactivity and size of its worlds have been expanded thanks to its many PS4 enhancements. Instead, the main drawback I found was the game’s image creator, which while functional, feels crude and far less intuitive than it should, as original shapes are created by drawing with one’s finger on the diminutive touchpad, which is far less natural and visually immediate than drawing directly 1:1 on a much larger Vita touchscreen. It’s annoying, but by no means is it a deal breaker. Like the original Tearaway was for the PS Vita, Tearaway: Unfolded is the pack-in launch game that the PS4 should have gotten. It leverages every unique feature of the console towards meaningful gameplay, without resorting to gimmicks or filler (although if you’re looking for more content to occupy your time with, there’s an impressive companion app for asymmetric co-op play, and “game-to-real-world” papercraft distractions are included as well). Most importantly, all these features serve as the backbone of a quaint, adorable story that you’re unlikely to experience anywhere else on PS4. 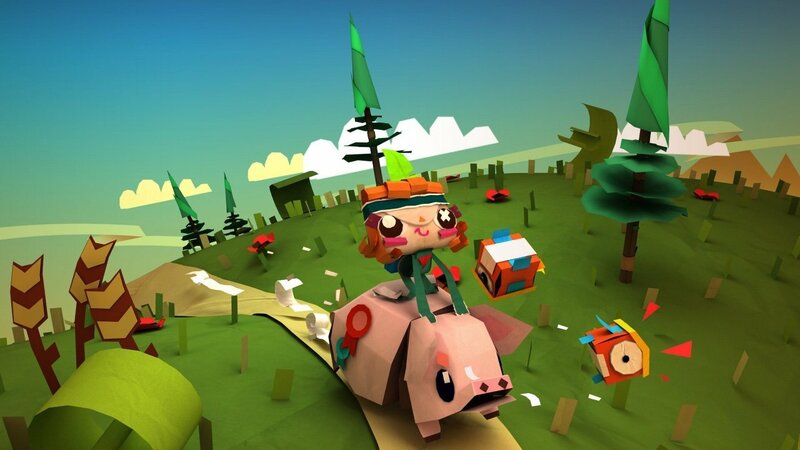 Mm has somehow managed to make Tearaway even more worthy of your attention than it was on PS Vita, so do yourself a favor and give this game the love that it deserves. Tearaway: Unfolded is no mere remaster or port, however. Half of the original Tearaway’s charm was its meaningful implementation of every key PS Vita hardware feature.